Sailing has been one of the most widely used forms of transportation throughout human history. The earliest known depiction of a ship appeared on a painted disc found in Kuwait dating back to the late 5th millennium BC. Then, in the last glacial period – 45,000 years ago- first seaworthy boats made their appearance. Today, shipping remains the preferred choice for moving large and heavy goods such as raw materials, machinery or cars around the world. While slower than flying, it is definitely a cheaper option with a lower environmental impact in terms of CO2 emissions. Ships are still a major driving force behind our global economy, and epoxies help protect them across the seven seas. 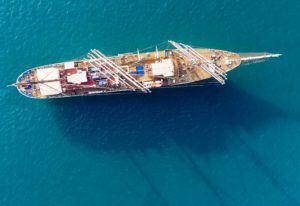 Because ships are continuously exposed to harsh marine conditions, they need well-formulated and resilient coatings to keep them from fouling, corroding or eroding. The global ban of Tri-Butyl-Tin in 2008, which acted as a highly effective anti-fouling biocide in hull and propeller coatings, lead to the development of a new type of anti-fouling layer made using silyl-methacrylate. The coatings are attached to the underwater hull using epoxy-based tie and primer coats. As a result, the build-up of layers of biofilms and marine organisms like barnacles has been significantly reduced, helping ship owners save around $30 billion of additional fuel cost per year and thus reducing by about 0.3% their carbon emissions per year. The marine industry is under increasing pressure to be as efficient as possible while complying with evolving environmental regulations. The speedy management of cargo without compromising the integrity of the goods is therefore of outmost importance. Epoxies meet strict performance requirements, as epoxy-based primers need minimal surface preparation and dry fast. In addition, they reduce the need for re-coating, which significantly shortens unproductive periods of docking maintenance. With all these benefits, it is not surprising that 45% of all marine protective coatings are epoxy-based. In 2014, about 97 million litres of resins were used in the Europe, Middle East, and Africa region alone in areas of the ship such as topsides and superstructures, underwater hulls, cargo holds, water ballast tanks and decks. A sizeable 70% of the global fleet of ships transporting bulky chemicals or oils cargoes have tanks made of mild steel. In this case, tank coatings have a double purpose. First, to protect the substrate of the tank against corrosion from often chemically aggressive cargoes and, second, to protect the actual cargo against external contamination. The tank coating must be versatile and durable to resist the diverse and constantly changing nature of cargo being transported. Container ships are another mainstay of global trade. 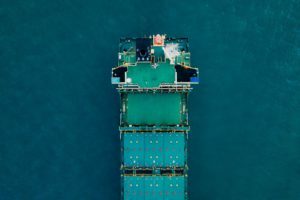 Since its modest beginning in the mid-1950s, container shipping has evolved into a major industry that has propelled trade to the four corners of the globe. Epoxies have played a major role thanks to their outstanding anti-corrosion properties and wear resistance. Epoxy-based coatings are supporting international commerce by helping with the building and maintenance of long-lasting vessels. This translates into lower costs for consumers and a lower impact on the environment. Smooth sailing all the way from production to end of life is guaranteed.